When a critical problem needs attention, advice from peers and experts is often valuable. While a phone call might be the fastest way to communicate, there can be circumstances where it doesn’t work or isn’t appropriate. That is why we built a chat feature into SIGNL4. The built-in mobile chat is always enabled and each alert (“Signl”) automatically provides its own chat room. To start chatting, simply go to the detail view of a Signl alert and add an annotation/comment. 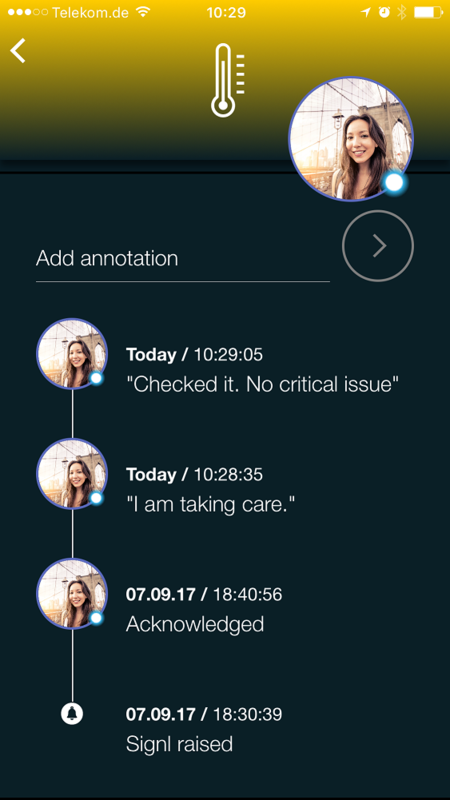 This annotation will then be sent via push notification to all your peers on duty. Once they open the notification, they are redirected to the annotation/chat history and can contribute with their messages. All chat messages (or annotations if you like) are displayed in the message time line. It is a simple as that. On top of that, the chats are persistent, so they don’t get deleted but stick to the according SIGNL4 alert. So, mobile ChatOps in SIGNL4 is reality and extremely easy to use. The difference to typical chat systems, though, is the fact that it is always incident-/alert-related as each SIGNL4 alert comes with its own chat room. Of course, we can also easily integrate with chat tools like Slack or Microsoft Teams. What SIGNL4 here provides is a special and quite different approach to quick communication within an operations team.